Mary Dunsford is a professional harpist, based in Cumbria. A keen string-player, Mary also plays piano, violin, viola and the ukulele. She is a member of the South Lakes Ukulele Orchestra. Mary studied Music at Lancaster University, and continued further to complete a Post Graduate Certificate in Education. 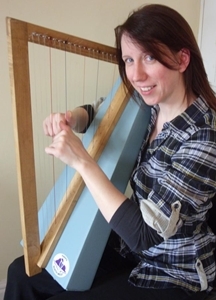 Mary has a particular passion for bringing the unusual instrument that is the harp to a wider audience, and she has spent many happy years teaching harp to adults and children alike in the North West of England. In 2010 Mary published her first book on learning to play the harp for adult beginners, to great acclaim. Mary is the current convenor of Harps North West, a charity whose main aim is to promote playing, teaching and appreciation of the harp. Mary has performed in all the top concert venues across the country, including London’s Royal Albert Hall, Sheffield Hallam FM Arena, and the Sage, Gateshead. Mary heads the Cumbria Cardboard Harp Project – a set of ten cardboard lap harps, and one enthusiastic teacher and player. These simple, lightweight but sturdy harps provide the perfect entry point to an often inaccessible instrument. In addition, the cardboard harps are lightweight and compact, making them ideal for use with those unable to move easily from their armchair or bed. The ease with which a beautiful sound can be created makes for a magical and rewarding experience. Mary is excited to be moving her focus towards music in healthcare settings, working with OPUS on the Furness Peninsula in Cumbria.